TRIVIA of Noh : Q75 : How many plays are performed? | Home | Trivia | Q75 : How many plays are performed? How many plays are performed? A large number of plays have been created since the birth of Noh. 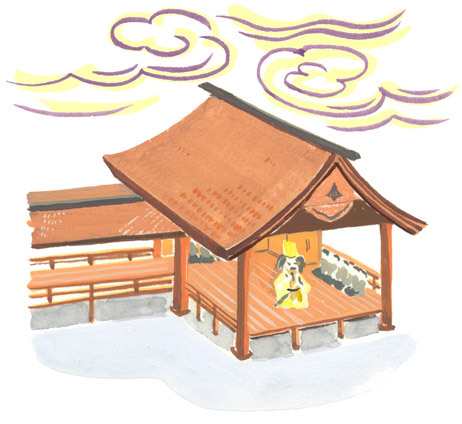 While the figure depends on the school, in the current theatre there are around two hundred plays performed as " genkō-kyoku (existing pieces)", which has survived the long history and risen above the times. Most of these plays were created by the end of the Muromachi era. In the Edo era, the patrons of Noh actors included the shogunate, so repertories had to be performed perfectly. Actors thus made their own repertory lists, and plays were naturally classified into two groups: "genkō-kyoku" and " hai-kyoku (discarded pieces)". The number of existing pieces is different at each school because they revised their repertories at their own discretion from the Meiji era. When a piece is among the hai-kyoku, this only means that it is not necessarily frequently rehearsed for actual performances; it does not mean that the play cannot be performed. In recent years, some hai-kyoku plays come back as fukkyoku (revived pieces). Reviving discarded pieces is a chance for both performers and theatregoers to see the attraction of Noh anew.